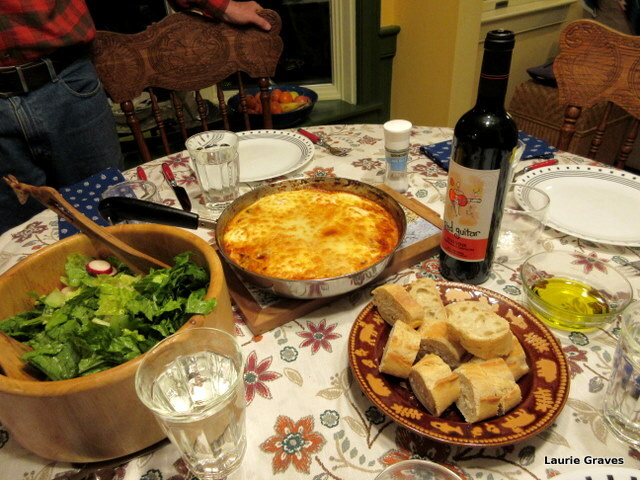 On Saturday, our friends Cheryl and Denny invited us to dinner. They live in a very old—for Maine—farmhouse, and it has been on this road for many, many years. As we ate the excellent meal—eggs cooked in a spicy tomato mixture that was both sweet and tangy—Cheryl and Denny spoke about the history of Winthrop and the Narrows Pond Road. We went back ten thousand years ago when the glacier receded and much of the area was underwater. Then we sprinted forward to the 1800s, when Winthrop was an abolitionist town, and Cheryl and Denny’s house was part of the Underground Railroad. Perhaps the town’s uncommonly good moral character led to Winthrop being an abolitionist town? We also talked about the stonewalls that run through the woods behind our houses. “This was once all open fields,” Cheryl said. A monastery? In Winthrop, which seems like a quintessential Yankee Protestant town? I wonder if the monastery grew wheat. I do remember that building. It was still standing when we moved here in 1984. By then the monastery was gone, and at one point the house had a copy center in it. For the past two days, I’ve been thinking about all the changes that have come to this town, to our little road. Once the glaciers were here, and then they retreated. On their way north, escaped slaves stopped in this town, for rest, shelter, and food. Their long journey was nearly over. And sixty or sixty-five years ago, there was open farmland all along this road. No woods. In fact, no little house in the big woods. (Our house was built in 1969.) How fast the trees take back the land. In his book Second Nature, Michael Pollan observes that nature abhors a garden. How right he is. Leave the land alone, and within sixty years or so it will fill in and become woods. This is heartening. We need trees and forests, and in parts of the world deforestation is a big problem. But where trees were cut down, they can grow back again, and in a relatively short amount of time. Nevertheless, a part of me yearns for the open fields, sprinkled with orchards, that were once here. I’ve seen pictures—taken from the top of hill, from the monastery, as it turned out—of what it was like in Winthrop when there was no main highway to cut the town in half, and there was a broad sweep of land that the eye could follow. Highways, forests, and fields. All necessary parts of life for people and so hard to get in just the right balance. Yes, we human colonise nature and altar the face of the earth to suit ourselves. I was once a bush regenerator so am aware of nature’s regenerative powers but leaving it alone may encourage growth of a sort that may further degrade the land. We Chinese have a saying, 解鈴還需繫鈴人 － to untie the bell requires the person who ties the bell (knot, problem). Nature needs our help sometimes. Mary, I love that saying. Judy, a mix of forests and fields is ideal. And,yes, we are very lucky indeed. A landscape with nothing but woods can get to seem dark and oppressive at times. I also prefer to have a few open fields mixed in. I cherish the few remaining farm fields we have left in this town – the open sky and land is soothing to the soul (after all, our ancestors felt safer on open land where they could spot approaching danger). It’s our default setting. Eliza, yes, yes! Beautifully put. I agree with Eliza, open views are soothing and comforting, allowing us to see what’s going on around us. I would love a little time travel to experience Maine in its farming heyday with open vistas everywhere. Imagine, all the work it took to clear those fields, and then they reverted to woods in two generations. I know! All that work gone in two generations. And a trip back in time would be so fascinating.